A global mining group conducted a shutdown and major overhaul of a large item of production plant to maintain its availability and operational utilisation. The shutdown involved the inspection, replacement or repair of those components that were worn or damaged or where their expected remaining life was less than 35,000 hours of use. If these components were not replaced or repaired preventive maintenance analyses indicated there was a high likelihood of failure that would lead to significant downtime and production loss. The principal objectives set for the shutdown and the actual performance are shown in Table 1. Replacement of components that had reached the ends of their lives. While the budgeting exercise tried to predict the replacement costs for components that had reached the ends of their expected lives, it was less successful in predicting the cost to replace or repair components that were found by inspections to have failed or to be degraded. This was the major cause of the budget overrun. Broadleaf was commissioned to facilitate a workshop that reviewed and analysed both the successes and failures of the shutdown and refurbishment project. A systematic root cause analysis process was used to determine the causes for a range of events and the lessons that should be learned. The group then used these to define actions aimed at preventing such failures and repeating such successes at future, similar shutdowns. There were 22 participants in the workshop, from the mining company and its principal contractor. All had first-hand involvement in the shutdown. Broadleaf followed the general process shown in Figure 1. 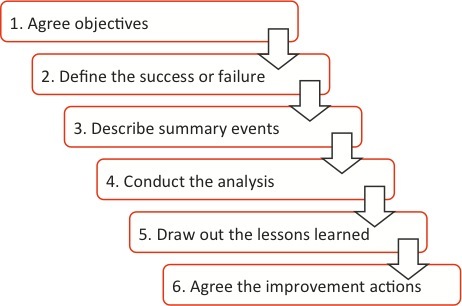 Our involvement stopped when step 5 was complete and the group went on to generate the action plan itself. Because the shutdown project was complex and involved a large number of sub-projects, and because most of the stakeholders were each only involved in one sub-project or element, it was important to ensure that all participants were properly briefed before the workshop. A structure for the workshop, including a set of key elements. The key elements used to structure the workshop are given in Table 2. A large off-site room was booked for the workshop. Tables and chairs to accommodate the 22 participants were arranged in a U-shape. The Broadleaf facilitator used a laptop computer with a video projector and large screen so that all participants could follow and contribute to the analysis. Flipcharts were also used extensively and completed sheets were posted around the walls. Workshop participants were encouraged to stand up and add material to the flipchart sheets. The Broadleaf facilitator created and projected the workshop output as the analysis progressed. The group provided a scribe who generated a complementary record of the discussions. After initial introductions and an outline of the process, the key element structure was followed to brainstorm a list of successes and failures. Agreed nominees presented the background to each key element and the facilitator recorded the suggested successes and failures on flipcharts for each case. Despite components from original equipment manufacturers (OEMs) not being compliant, detected these and modified them. The majority of people were not properly authorised on time. Once the workshop had generated successes and failures for each key element, these were grouped for further analysis under a series of ten issues. We used fish bone analysis, employing the ‘4 P’ (People, Place, Process and Policy) methodology (see Figure 2), to help the participants to derive root causes. These analyses were recorded using MindManager™ software and projected to make them visible to participants. For each issue the completed fish bone was used to extract lessons and to suggest actions that should be considered by the group. Figure 2 shows an example fish bone. Table 3 is a summary of all the issues analysed with some example lessons learned in each case. The exercise involved 22 people for a full day and it was remarkably productive. With shutdowns costing tens of millions of dollars, the return from this investment of time would be considerable if all the lessons were applied for all similar projects across the group. The review generated 62 separate lessons that the workshop participants agreed the mining group should learn. Some of these arose out of successful elements of the project while others involved aspects that did not go as well as they should. Although overall the shutdown was considered a success, it cost over twice the budget estimate. This was due to many unforseen costs and process inefficiencies. It was obvious that some of the issues that arose made life very difficult for the project team and if they had not been resolved quickly, with ingenuity and hard work, significant delays and therefore substantial production loss would have occurred. Despite the costs incurred, if the intended work had not been completed, then the future availability of a crucial plant item and the revenue that depends on its continued operation would have been at risk. Even the relatively simple form of root cause analysis used here (fish bone analysis) can be powerful and highly productive when the exercise is facilitated well. To download a pdf version of this case study, please click here.